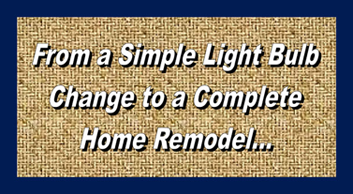 Handyman Service in Daytona Beach, Ormond Beach and Port Orange. JK Handyman Service offers Homeowners and Commercial Clients a wide range of installation, maintenance and repair services. From replacing a light bulb to a complete renovation, Quality is delivered in every aspect of the project. Reliable, Meticulous and Professional is the JK way. We take pride in all that we do and our referrals stand behind that fact. large and small are always welcome. JK Handyman Service provides remodeling and renovation services, screen enclosures, fencing carpentry and more in the Daytona Beach area and offers complete Handyman services in Port Orange, Holly Hill, Ponce Inlet, New Smyrna, Daytona and South Daytona. To keep your home up to snuff, look toward The JK Plan… We are also a proud member of Angie's List. Daytona, wood decks in Port Orange, soffit installation in Daytona, JK handyman service is Volusia County’s Best Painting Contractor.